It's winter and most of us are away from Morningside Heights for a month without classes. The garden is dormant for the season, but some of us are thinking about the spring and what we would like to do with the 1000 sq ft we have PLUS the area of expansion AND the demo rooftop garden, which will be located adjactent to the east garden plot. We received $600 from the SGB and $500 from the CC Student council, so we have a solid amount of funding to invest in a mini-greenhouse, plants, more tools, and other garden needs. We'll dive into planning January 21st, our next meeting date. Meanwhile, check the calendar for events happening throughout the winter and enjoy those root vegetables! Read below for more ideas to support sustainable food this season. Most importantly, take note of our new elected secretary of agriculture, Tom Vilsack and secreatry of the interior, Ken Salazar. The jury is out, but so far the choices have received mixed reviews based on contentious issues they will face like farm subsidies and offshore drilling. - Eat more locally grown whole foods: fruits, vegetables, grains and meat that you prepare. It's good for you and good for the earth. - Read about sustainable food. Beyond Michael Pollan's Omnivore's Dilemma and In Defense of Food, there are plenty of good books on food. 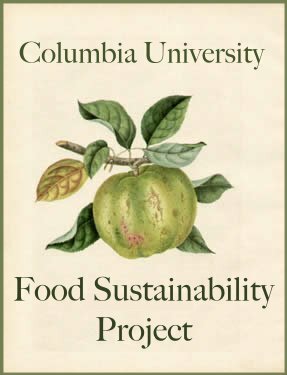 Try Hungry Planet by Peter Menzel and Faith D'Aluiso, Columbia Professor Joan Dye Gussow's This Organic Life, The End of the Line: How Overfishing is Changing the World and What We Eat by Charles Clover, and What to Eat by NYU nutritionist Marion Nestle. - Host a Farmers Market potluck dinner. - Shop at a Farmers Market once a week. - Plant something edible - on your windowsill or in a pot. All it takes is that first bite of a homegrown tomato to realize how precious good food is. - Learn how to can and preserve seasonal foods. - Cut down on plastic bags and recycle those that you do use. The City Council passed a bill this year requiring large stores (over 5000 sq. ft) and retail chains to collect and recycle plastic bags if they give them to shoppers. If you don't see a recycling bin, insist that the store get one. - Make a worm composting bin in your apartment. You can compost up to six quarts or more of vegetable matter a week. Or, drop off food waste at the Union Square farmers market, courtesy of Lower East Side Ecology Center.